The Linus Connection: 2012 Challenge and Birthday Celebration! 2012 Challenge and Birthday Celebration! 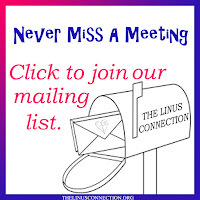 On October 20, 2012, The Linus Connection celebrated our 13th Birthday and our 8th Annual Challenge! For previous celebrations, click here! Executive Director, Stephanie Sabatini welcomes everyone to our celebration. Special Guest, Sandi, from WIC Cedar Park shares how Linus blankets affect the families she's worked with. Osie explains our 8th Annual Challenge. This year, we partnered with fabric company Timeless Treasures with a fun, child-friendly fabric called Mechanical Genius. 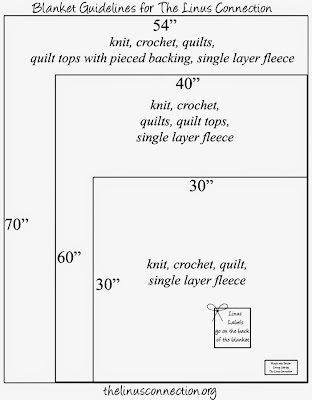 For yarn blankets, we offered choices that coordinated with these great Timeless Treasures fabrics. 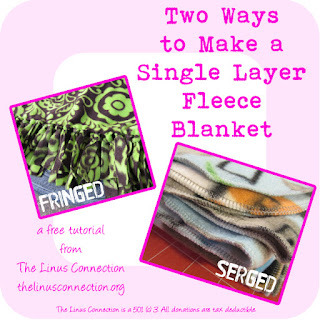 All participants work with the same fabrics or yarns to create their Challenge entries. Viewer's Choice Favorite Quilts & Yarn Blankets! Visitors and volunteers alike had a chance to vote on their three favorite blankets for 2012. The top two quilts and top two yarn blankets were chosen for the Viewer's Choice awards. Viewer's Choice (quilt) by Diana Apgar wins a gift certificate donated by Honey Bee Quilt Store. Viewer's Choice (quilt) by Shelley Daley wins a gift certificate donated by Honey Bee Quilt Store. Viewer's Choice (yarn) by Amber Lowery wins a gift card to Joann Fabrics and Crafts. Viewer's Choice (yarn) by Dorie Lusk wins a gift card to Joann Fabrics and Crafts. Our meeting included lots of blanket packing and sorting, great donated fabrics, wonderful treats made by our volunteers, a fun silent auction with donations helping buy supplies, lots of great door prizes and a fun guessing game! Wonderful fabrics for our volunteers to choose from! Our blanket sorters, hard at work! Signing in for the meeting. ' Lovely donated silent auction items. The winner was Jo Carls, with a guess of 1,411! The actual number of pins in the jar was 1,415 -- guesses ranged from 375 to 6,240. Visitors enjoying the wonderful show! 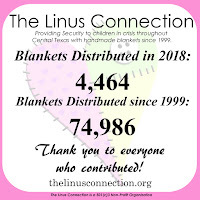 Our mission is to comfort children in crisis in Central Texas through our handmade blankets. Each year, we are able to make a difference through your continued support. 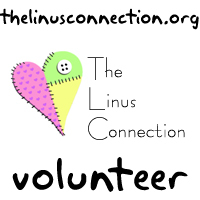 THANK YOU to all the volunteers, sponsors and friends of Linus that help us succeed in our goals. It's really a privilege to be part of this group...the creativity that shows up every month is fantastic, and the challenge quilts..can't be beat. I'm really grateful for a chance to be a part of the Connection! What an awesome group of blankets and quilts!!! What a beautiful collection of blankets!! Hats off to all of you!